Equipment: 102mm Maksutov-Cassegrain telescope, 32mm, 25mm, 15mm, 12.4mm eyepieces, tabletop mount, AstroMaster 76’s mount. New equipment! A 102mm Maksutov-Cassegrain telescope from Orion with a tabletop mount, suitable for packing in one’s luggage and taking on a trip. There weren’t any new observations this night, but I did get first light on a new telescope. For a while now, I’ve wanted a small portable telescope that I could fit into my luggage and take with me on a trip. My other telescopes are portable, sure, but they take up a lot of room and can be hard to fit in the car if there’s too much other stuff. This telescope is a 102mm Orion Maksutov-Cassegrain telescope paired with a tabletop equatorial mount. This was the first clear night since I got the telescope, and I was determined to make use of it. I bundled up like I was going skiing and headed out. I only used the tabletop mount briefly. It worked fine, but unfortunately I didn’t have a very sturdy table to use, and the 45º erecting prism wasn’t really enough to get convenient looks through the eyepiece. I think it will work fine on a more stable surface, and I’m getting a 90º star diagonal as well which should make it easier to use as well. Despite its small size, the mount appears to be quite sturdy. Polar alignment’s a little tricky, but that can be worked with. Even if I did astrophotography, though, I don’t think I’d use this mount for that anyway. The telescope does kind of push the mount’s boundaries a bit, but it’s still within the weight limits listed for the mount. This telescope fits the mount that came with my Celestron AstroMaster 76, though, so for convenience’s sake I just switched it over to that for the rest of the night. It would be better if this scope shipped with a 90º diagonal instead of a 45º one, but I don’t have any other complaints about this telescope. 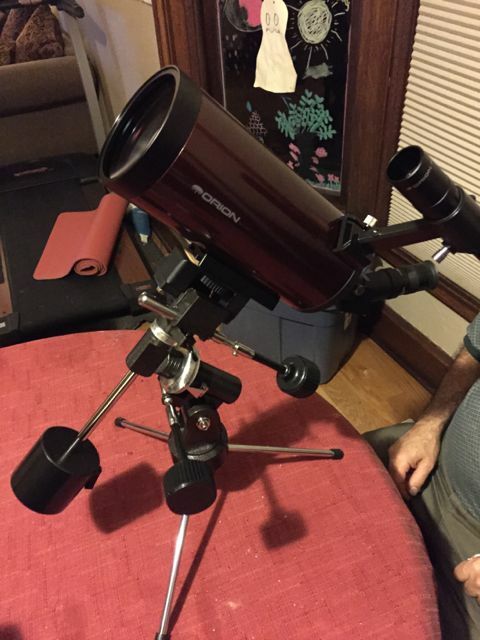 The optics looked good, and while the main reason I got it was for the portability I think it will be useful for looking at planets, double stars, and other small but reasonably bright objects. Jupiter looked pretty good, although seeing was kind of crap. M42 was easily visible, although obviously without the same majesty you would see in the 16” Dobsonian. I think it will work great for what I wanted it for, but I wouldn’t want it to be my only telescope or anything. I had some trouble with eyepieces dewing up, and the AstroMaster’s mount isn’t exactly the most stable mount in existence, so I didn’t get to use the telescope’s full potential. Still, it was pretty cool, and I look forward to using it more.